Who doesn’t love a day out at the horses? 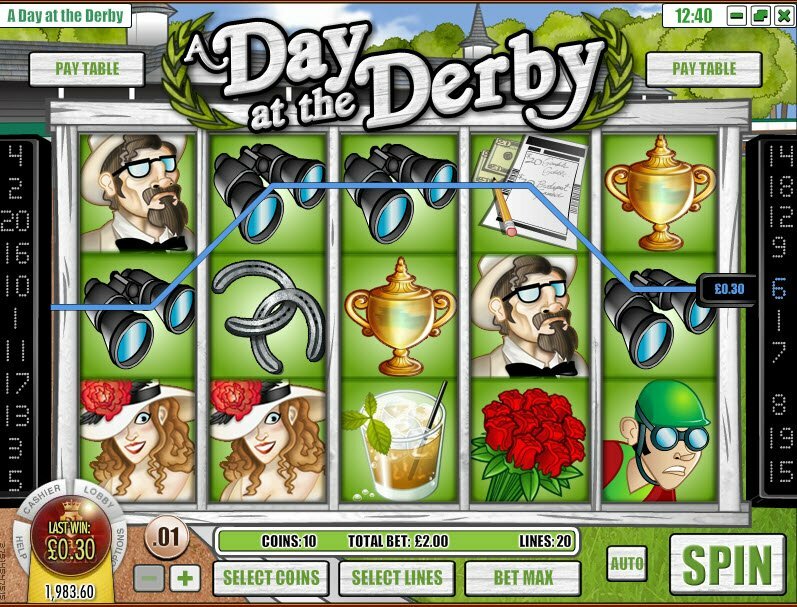 Well, A Day at the Derby slot is no different, the atmosphere is spot on and, apart from the usual poor graphics, this slot game has an enjoyability factor not just limited to its bonus round game. The crowd is going wild with enthusiasm, screaming their heads off, the horse slides into first place and is immediately covered, along with the spry jockey, in roses and adulation. As you spin these reels, you will hear the hoof-falls so unique to A Day at the Derby slot game. Graphics are the usual poor imagery yet imaginative offering from Rival Gaming that we have come to love and expect. I do find their games innovative and a treat in terms of fun but, they always feel like a little something is lacking in the graphics unfortunately. 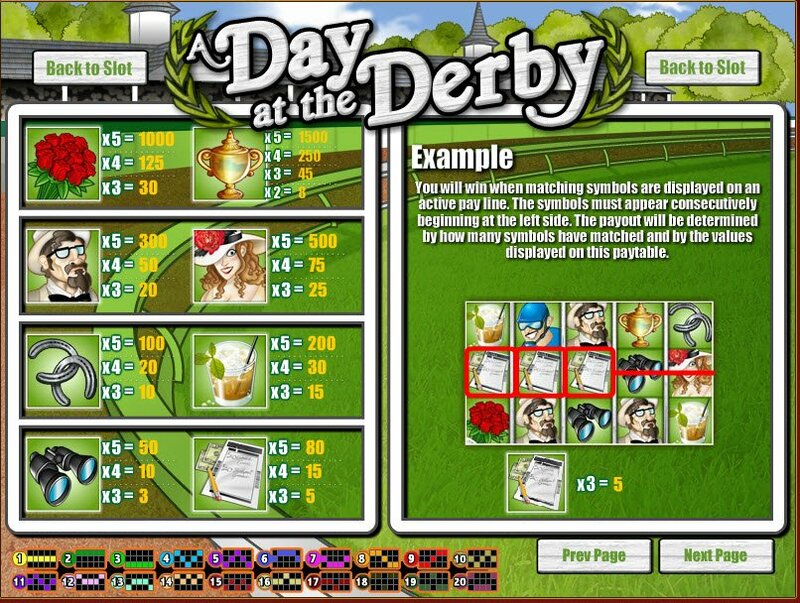 There is a nifty feature in A Day at the Derby slot game where the amount of your winnings will pop out next to the line you won on, so you can easily keep track of what you are bringing in during the excitement of the races. Our suave jockey will hit you up with 5 free spins as soon as 3 or more of his grinning face symbol is revealed on our reels. If you manage 4 of his smirking goodness, you will be awarded 10 free spins and, you will really get A Day at the Derby 20 free spins when 5 of his handsome mug are spun into place. Hit the A Day at the Derby Slot Jackpot with our green helmeted jockey for up to 25000 coins! The brown horse neighs with triumph when you spin this wild symbol to 3,4 or 5 in a reel row, although he will only appear on reels 1, 2 and 3. Your wins will be multiplied by the number of wild brown horses you have managed to drag through to your reels. 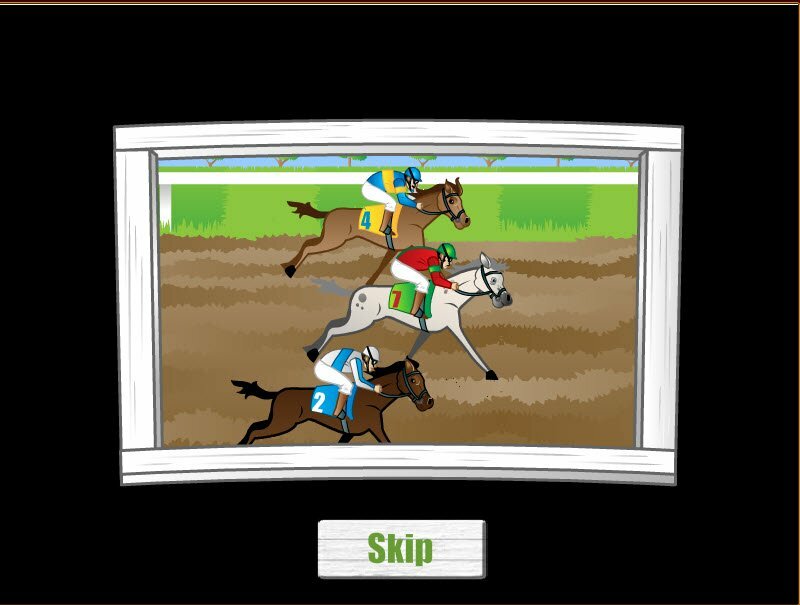 For A Day at the Derby bonus round, find 6 or more bonus icons, like the white horsey, on the screen, lost within your reels and spark a game of pick your horse to see if he will be fruitful. You even get to watch the race and root for your boy. I only got second place but, that was still a hefty 5000 coins.